The day was quite pleasant, with the ambient temperature fluctuating between 25-27° and grey clouds blocking off the sun which had been soaring temperatures in Mumbai for over a week. Lonavala was still lush after the rains and the only warm hue in this setting was the fiery red Cayenne GTS you see here. The car is quite different than the one we drove over four years back, because this one is based on the updated Cayenne that Porsche brought to India this April. It not only benefits from the tighter lines of the refreshed design, but the body-coloured skirting all around and the lack of a bash plate also gives it a sleeker stance than its siblings. There are the gloss black quad exhaust tips, matte black 20 inch alloys and the smoked black tail lights that aim at justifying the distinctive GTS badges (in black again). Their counterparts on the inside are the sportier seats, Alcantara upholstery, red seatbelts and matching red stitching on the seats, dash and steering wheel. The steering wheel itself comes from the flagship 918 Spyder's design book. It gets sleek and tall paddle shifters too, which are connected to the eight-speed tiptronic gearbox. Even globally, Porsche isn't offering a manual on the Cayenne GTS anymore. 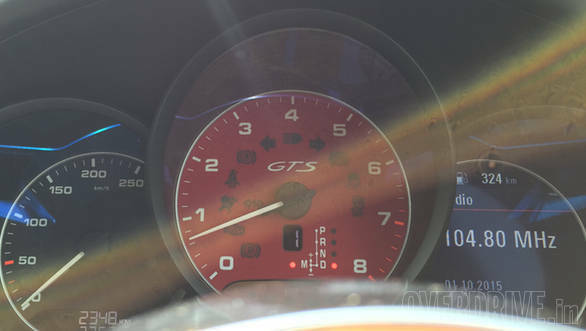 Typical to Porsche, the gearbox is quick and has very smooth shifts with no transmission shocks whatsoever even in the aggressive Sports Plus. But the big news is the engine that it is mated to - a 3.6-litre bi-turbo V6 from the Cayenne S. It replaces the 4.8-litre naturally aspirated V8. Interesting, how the entire line-up of Porsche cars will soon be turbocharged. The engine is tuned to provide a linear power and torque delivery and it is hard to notice that this is a turbocharged car. There is no lag or surge and no waste-gate whistles either. The V6 isn't too loud and has a nice howl that even your neighbours won't complain about. 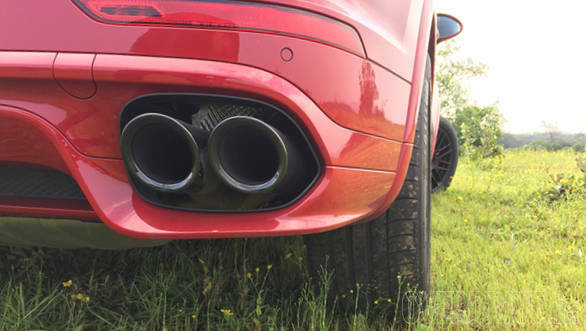 The sports exhaust is standard and let's you bump up the exhaust note by opening flaps inside the muffler, but if you are expecting crackling sounds like other German bigwigs, then you will be disappointed. Porsches are smooth and this fact is even made audible with the exhaust note. Despite losing two cylinders, the new engine manages a better output. Compared to the V8's 420PS/515Nm, the V6 churns out 440PS and 600Nm. Porsche claims that the acceleration has improved and the Cayenne GTS now manages to sprint from naught to 100kmph in 5.2s (5.1 with the optional Sport Chrono pack's launch control system). The best we managed was 5.5s with launch control and 5.8s without the assistance. Though the engine doesn't sound very dramatic, the acceleration runs can be pretty ferocious. Those figures are proper sportscar territory and when you experience them sitting fairly high up, you can see how quickly the tarmac underneath you is disappearing. 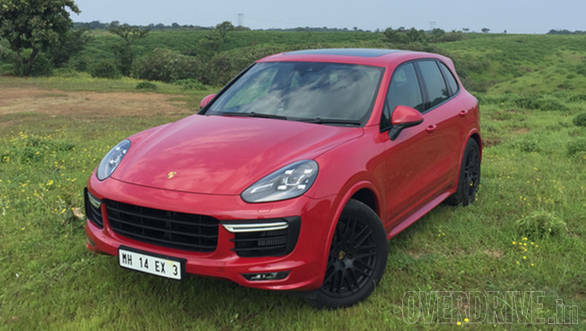 The Cayenne GTS keeps gaining speed rapidly even closer to the 200kmph mark and it does it without much drama. The car even has tiny rear view mirrors that are fit for a Cayman. But while they look puny on a burly SUV, they generate a wind noise closer to 170kmph. Throughout our test, the only corners we encountered were some winding sections on the country roads. 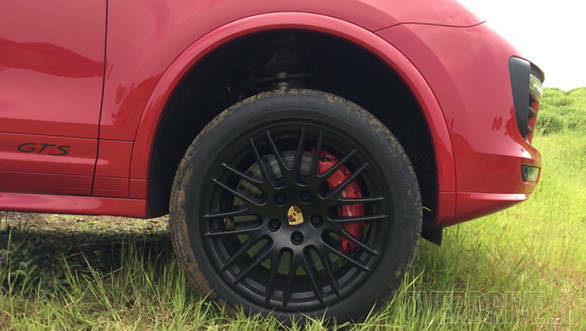 So pushing the Cayenne GTS to its handling best wasn't really possible. But that said, I had sampled the older Cayenne GTS on a handling circuit in Germany and it had left me impressed. The new one is suspended from a better suspension setup and that should make for even better handling dynamics. Even on the sections I drove on, there was very little roll I experienced and the torque vectoring system worked quite well. There was a hint of understeer on slightly tighter corners and I could sense the system working hard to brake the inner wheels to improve agility. But the Cayenne is a big car after all and there is only so much that the electronics can do to negate the effect of its size on the dynamics abilities. And that big size and the SUV form are what make the Cayenne the best selling model for Porsche. But the GTS is purely aimed at the driver and not the chauffeur driven type. And more particularly, the driver who doesn't like to share his car. Why else would an SUV that costs over Rs 1.4 crore, come without memory seats as standard?